When Dravida Munnetra Kazhagam chief and five-time Chief Minister of Tamil Nadu Muthuvel Karunanidhi passed away on 7 August 2018, he had outlived most of his friends and all of his rivals. “Kalaignar,” as he was popularly known among the Tamil people, left behind an active political life of 80 years, six decades of which were spent as a legislator. 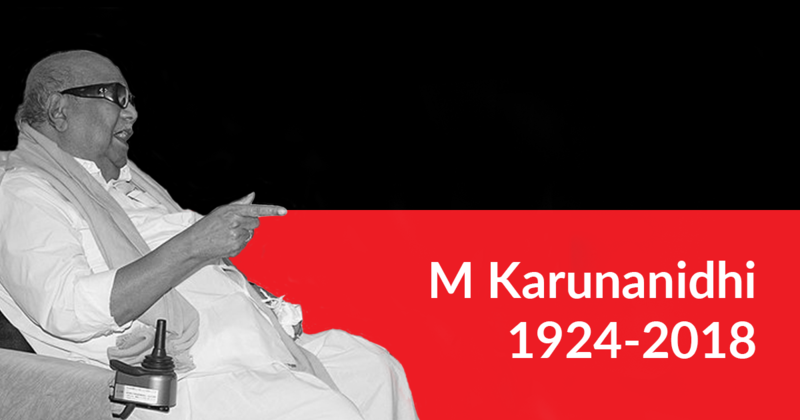 Born on 3 June 1924 into a poor family from an extremely marginalised backward caste, M Karunanidhi was witness to key events of the last century that shaped the world as we know it today. He was also a key participant in events that radically shaped the nature of politics in Tamil Nadu. In an interview on 16 February 1965, a correspondent of Pravda, the official organ of the Communist Party of the Soviet Union, asked Karunanidhi about the goals of the Dravida Munnetra Kazhagam (DMK). Karunanidhi responded that the goals were social justice in society, rationalism in culture, socialism in economy, and democracy in politics. The route to achieve these goals, he said, was via the parliament. Hailing from a community that was stigmatised by an oppressive feudal system in his hometown of Thiruvarur, he was drawn to the radical anti-caste discourse of Periyar. His own experience of caste humiliation played a significant role in his approach to politics. In an interview, he said “Only a person who is subjected to humiliation can think of performing surgery to get rid of gangrene and not indulge in a cosmetic cover-up” (Pannerselvam 2017). As a teenager, he was an avid reader of Kudi Arasu, the Self-Respect movement’s mouthpiece, and would later join its editorial team. He was 14 when he took part in the anti-Hindi agitations, decrying the imposition of Hindi. At 15, he edited Manava Nesan, a handwritten fortnightly newspaper that was circulated among his school mates and friends in Thiruvarur from 1938. After this newspaper became defunct, he launched Murasoli, a pamphlet publication in 1942. He endearingly referred to it as his first child and it later became the official daily for the DMK. His flair for the Tamil language brought him to the attention of the politically astute C N Annadurai, who saw in the young activist an able lieutenant of the Dravidian movement. Karunanidhi would side with the pragmatist Annadurai over the militant Periyar when the former made a decisive political break with the Dravidar Kazhagam (DK) to form the DMK in 1949. M S S Pandian (2011) writes that the politics of the DMK was built around two major ideological planks. The first was caste-based social justice; the second, Tamil identity. The politics of social justice took the form of a critique of caste hierarchy and Brahminism coupled with continuous improvisations in the reservation of government jobs and seats in educational institutions for the lower castes. Tamil identity was more than a language. Tamil, for Karunanidhi, was simultaneously anti-Sanskrit, anti-caste, and secular. It produced horizontal solidarities among Tamils, contesting the politics of the mainstream Indian nationalists to create congruence between Hindi, Hindu, and Hindustan. The screenplays that Karunanidhi penned for popular films like Parasakthi (1952) and Manohara (1954) took the DMK’s message to the masses, and cemented his position within the party. Such was his influence within the party that Periyar acerbically referred to the DMK as the “Thiruvarur Muthuvel Karunanidhi” party (corresponding to the Tamil acronym for the DMK, Thi Mu Ka). Yet, the same Periyar would chide M G Ramachandran (MGR) when the cine-star split from Karunanidhi to form the Anna Dravida Munnetra Kazhagam (ADMK) in 1972. Karunanidhi, who had played a key role in bringing the DMK to power, had a tougher time maintaining that power after he took over from his mentor Annadurai following the latter’s demise in 1969. Despite facing MGR’s split, the All India Anna Dravida Munnetra Kazhagam (AIADMK) challenge, and the dismissal of the state government twice—once during the Emergency under charges of corruption and the consequent imposition of the President’s Rule, and the second time in 1991 by Chandra Shekhar’s coalition under the dubious Article 356—the DMK managed to push forward schemes for social and economic justice. In 1969, the DMK set up a backward class commission, the first of its kind at the state level in independent India, to identify and increase the provision of reservations for backward castes in Tamil Nadu. Karunanidhi took a pro-Dalit stand. He increased the reservation for Dalits from 15% to 18% as against the commissions’ recommendation of continuing it at the pre-existing level of 15%. He increased the backward caste reservation from 25% to 31% although the committee recommended it to be increased to 33%. Later, when the AIADMK led by MGR flirted with the idea of reservations based on economic criteria, it was militantly challenged by the DMK, leading to a rout of the former in the parliamentary elections of 1980. The discourse of social justice popularised by the DMK and the competitive electoral compulsions led MGR to increase the reservations for the Other Backward Classes (OBCs) to 50%. In 1989, when Karunanidhi returned to power, he responded to the Vanniyar agitations and provided 20% separate reservation within the OBC quota for the most backward castes, including denotified communities in order to check the over-influence of a few dominant backward castes. He welcomed the implementation of Mandal Commission at a time when the north saw huge protests against the same. By passing a unanimous resolution in the assembly in support of V P Singh, he made the Mandal commission implementation a moment of jubilation in the state. Likewise, in 2007, the DMK also provided 3.5% quota each for Muslims and Christians within the OBC share of 30%. In 2009, Karunanidhi introduced the Tamil Nadu Arunthathiyars (Special Reservation of seats in Educational Institutions including Private Educational Institutions and of appointments or posts in the Services under the State within the Reservation for the Scheduled Castes) Act to ensure representation for the most marginalised among the Scheduled Castes (SCs), providing them a sub-quota of 3% within the SC. When taunted by the AIADMK for being a “minority government” during the 2006–2011 tenure, Karunanidhi responded with characteristic wit that his was a government for the minorities. The Tamil Nadu Land Reforms (Fixation of Ceiling on Land) Act, 1961 was amended during the Karunanidhi government in 1970, and the ceiling area fixed earlier at 30 standard acres was reduced to 15 standard acres. His government distributed the acquired surplus land to landless peasants. An ex-bureaucrat who worked closely with Karunanidhi recalls an incident from 1969, when the poor peasantry was fighting for landholding rights in Pudukkottai, and Karunanidhi joined them and travelled the entire region, addressing 19 meetings in a day. To his critics from the left, he asked “what do you know about deprivation that I do not know?” (Narayan 2018). “A committee would be constituted to look into sharing of powers between centre and the state. Tamil Nadu government has decided to constitute the committee. Giving more powers to the states would not affect the unity of the country” (Karunanidhi 2008: 73). In this spirit, the Rajamannar committee was formed and a resolution for state’s rights was passed in the state assembly. In the National Development Council meeting held on 18 April 1969, Karunanidhi participated and spoke in Tamil. He emphasised on reviewing the centre–state relations and demanded for the arrangement of a chief ministers’ meeting to discuss this further. Based on the observations submitted by Justice Rajamannar on state autonomy, a detailed report was prepared including the suggestions by a committee that involved leaders like Murasoli Maran and R Sezhiyan. The report was discussed in the ministerial meeting and subsequently a resolution on regional autonomy was passed in the state assembly in 1974. This was the first resolution of its kind to be passed in a state assembly in India. He said that this resolution had invited angst from the centre. His government was dismissed two years later. When Indira Gandhi declared the Emergency on 26 June 1975, the very next day, Karunanidhi convened DMK’s chief executive meeting and passed a resolution demanding Gandhi to withdraw it. This was the first formal opposition put forward by any party in the country against the Emergency. Along with the dismissal of the DMK government, several hundreds of party functionaries (including Karunanidhi’s son M K Stalin) were arrested under the notorious Maintenance of Internal Security Act across the state. Murasoli Maran, Karunanidhi’s nephew, was also arrested because he published a cartoon in Murasoli depicting Gandhi as Adolf Hitler. The DMK’s slogan of “collective rule at the centre, autonomous rule at the state” and Karunanidhi’s attempts to build a coalition of regional parties to take on Gandhi are very relevant in the Bharatiya Janata Party (BJP) era today. This led to death threats being issued against him. Amartya Sen and Jean Drèze (2011) argue that Tamil Nadu has seen a gradual consolidation of universalistic social policies and has built an extensive network of “lively and effective healthcare centres” offering access to people from across social groups. Part of the credit for this goes to Karunanidhi. The history of public distribution system (PDS) in the state is closely linked with the DMK assuming power in 1967. The DMK came into office with the promise of supplying three measures of rice per rupee. Thanks to Karunanidhi, by 1976, the entire state was covered by the PDS. Since then, Tamil Nadu has been maintaining universal PDS while most other states in India have implemented targeted PDS since 1997. The coverage of different caste groups by the PDS also shows that caste groups that are placed at the bottom in social hierarchy have better access to the PDS in the state than their counterparts in other states. Narayan (2018) observes that it was Karunanidhi who built the basic infrastructure like the Small Industries Development Corporation and State Industries Promotion Corporation of Tamil Nadu which became the basis for industrialisation in the state. The establishment of the Tamil Nadu Civil Supplies Corporation and a range of welfare boards enabled the state to achieve a model of fairly inclusive development. Criticisms of Karunanidhi are aplenty. While Hindu nationalists accuse him of being anti-Hindu, the mainstream media has generally portrayed the DMK as corrupt and inefficient. Indeed, Karunanidhi saw the hostility towards him among both the elite national media and the national parties as emanating from a deep-rooted caste prejudice as well as a general contempt for south Indians. It is not uncommon in Tamil Nadu to find liberal elites, caste-based outfits, Hindu communalists, and Tamil chauvinists parrot strikingly similar criticisms of Karunanidhi. Ironically, many of these groups have little qualms about hobnobbing with the AIADMK. Of course, Karunanidhi’s rule was anything but flawless. The July 1999 Manjolai massacre of 17 Dalit labourers protesting for better wages in tea-estates drew considerable flak from Dalit, left, and civil rights groups in the state. Likewise, the DMK government’s failure to take a decisive stand against the genocide of Tamils in Sri Lanka in 2009 brought much criticism, even from intellectuals and academics sympathetic to their politics. Many Tamil nationalists view it as an unforgivable act of betrayal by Karunanidhi. Other critics of the DMK have also decried Karunanidhi’s nepotism and his tendency to favour family members over veteran leaders. The demise of the last key leader of the Dravidian movement is nevertheless significant not only for the history of his contributions, but also for what it means for the future of politics in Tamil Nadu. The ruling AIADMK government has functioned more or less as the proxy of the BJP, and has been ruthless in curbing and crushing democratic protests. Caste groups practice an unwinnable form of identity politics, making solidarities impossible. The left has always been clueless about the specific character of Tamil polity, while the Congress is a meager force in the state. Only two political formations seem to be ascendant: the Hindu communalist BJP and a particularly chauvinistic form of Tamil nationalism. While the DMK appears to be losing its radical ideological edge, recent years have seen a resurgence of interest among youth groups in the works of Periyar and the Dravidian legacy. The DMK also needs to re-invent itself. Deprived of its patriarch, it needs the robust spirit, the political agility, and intellectual dexterity of Karunanidhi from the 1940s to the early 1970s. The later Karunanidhi, as critics may legitimately accuse, acted much in self-interest. Then again, if social and economic indicators are anything to go by, his contributions to the state were historically significant. In the famous courtroom scene in Parasakthi, the lead played by Sivaji Ganesan rhetorically says, “In my self-interest, there is public interest as well.” That would be ideal as Karunanidhi’s epitaph.
) is at the Centre for Studies in Social Sciences, Calcutta. The authors would like to thank S Anandhi, Ezhilarasan, Jeyaranjan, V M Subagunarajan and M Vijayabaskar for their inputs. Posted August 18th, 2018 .